The Coleman Evanston Tent is an economical, 3-pole dome tent optimized to perform in rainy weather. White-over-green fabric tent panels blend in with forested campsites. The Evanston is a 3-pole dome tent, utilizing a standard, two-pole dome design with a 3rd pole arching over the front door. This makes the doorway more vertical, increasing headroom and easing entry into the tent, especially for tall campers. Non-closable mesh panels form the upper walls of the tent to the sides. However, the mesh panels begin further up the side walls than with many 2-season tents, which allows the rainfly to overlap the mesh by several inches. This means the Evanston can better resist wind-blown rain and keep spray out of the tent body. The front and back walls of the tent are solid fabric, with a D-shape, roll-back door in front and a closable window on the back wall. A separate, 4th rainfly pole forms a hoop in front of the Evanston Tent body to support a winged canopy over the doorway. During rain, this canopy porch will allow entry into the tent while keeping rain out. Four guyout points along the canopy secure it against moderate wind. A separate, shorter brow pole extends the rainfly over the back window to form a small canopy, allowing it to remain open in vertical rain. An electrical extension cord can pass through the e-Port to the left of the front door to power 120-volt equipment inside the tent. The Evanston 4 floor dimensions are 10' wide by 8' deep by 68" (5'8") high. The 80 square feet of floorspace is rated to sleep up to 4. The Evanston 4 should comfortably sleep 2-3 adults or a family of 4 with children. 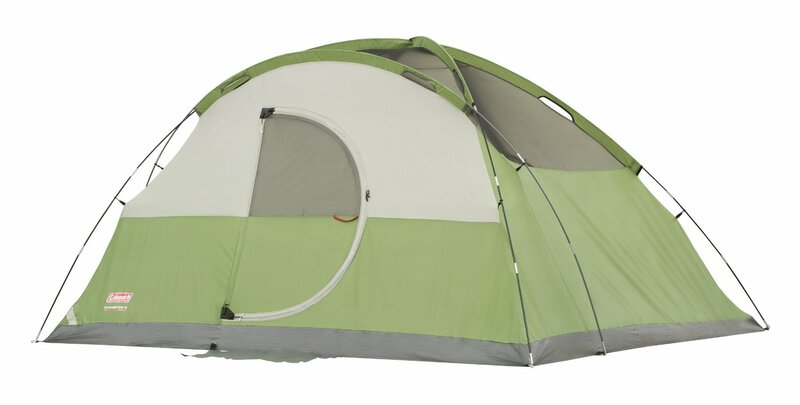 This tent is best suited to twin air mattresses along each side wall, which leaves room in the center for standing. However, a queen air mattress will fit inside, if campers don't mind crawling around the sides of the tent. With 68" of height at the center of the dome, many adult campers will need to stoop inside the tent to get around, but will be able to dress on their feet. The floor plan does, however, offer generous sleeping, if not standing, space for 3 tall campers. The Evanston 4 weighs 16 lb. Campers considering the Evanston 4 will likely be happier with the Evanston 6, shown next, which costs only slightly more and features good headroom and more floorspace. The Evanston 6 floor dimensions are 11' wide by 10' deep by 72" high. The 121 square feet of floorspace is rated to sleep up to 6. The Evanston 6 should comfortably sleep 4 adults or perhaps a family of 5 to 6 with children. The ceiling height of 72" allows campers of average height to stand upright in the center of the tent. The tent can probably just hold two queen air mattresses for campers who need only a sleeper tent without room for much else. A single queen, two twin mattresses or self-inflating pads would be much more comfortable. The dimensions of the Evanston 8 are 12' wide x 12' deep x 76" (6'4") high. The 12' x 12' floor plan is about as large as a dome tent body can be designed for basic family camping. Campers looking for "the largest dome tent" can consider the Evanston 8. The 144 square feet of floorspace is rated to sleep up to 8. Tall campers will appreciate the 6'4" of height at the center of the tent body. Campers of average height should be able to move about a bit while standing, which is unusual with dome tents. With a single door, the Evanston 8 should comfortably sleep 4 to 6 adults, or perhaps a family of 8 with young children. The Evanston 8 features a hinged door, probably due to the large number of people who might need to open and close it. The door has a flexed pole along the outer border to allow the door to keep its shape when unzipped and to swing open and closed. Velcro tabs secure the door closed. This feature is popular for families with young children, who may have difficulty working the door zipper to get in and out of the tent. Adults won't mind this feature either. The Evanston 8 can hold a large family, and yet the tent body will still fit on a 12' by 12' tent pad, although the front of the rainfly canopy will extend beyond the tent pad, and the wings may need to be rigged off of the ground a few inches. Campers are more likely to encounter 15' x 15' tent pads than 12' x 12' ones and likely shouldn't have a space issue with setting it up on a tent pad. The Evanston 8 is well suited to medium to large families with small children. This tent can hold 2 queen air mattresses with space in the center for standing and dressing. 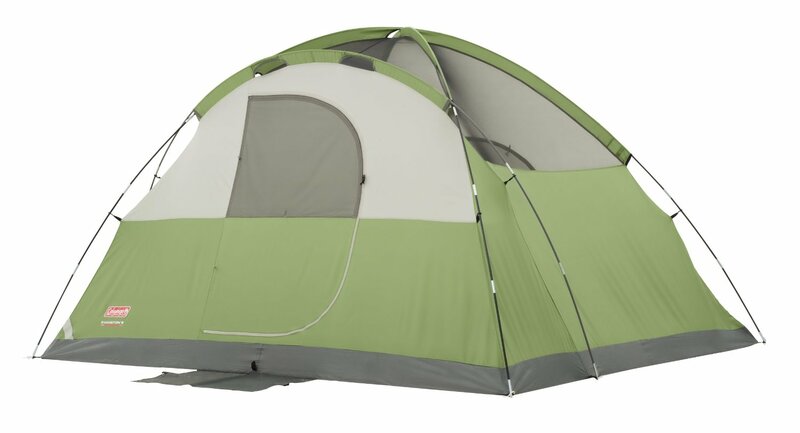 The Elite Evanston 8 Tent is the same design and dimensions as the Evanston 8, but has additional features. The colors are white over navy blue, with red trim around the borders of rainfly. A flat spring coil inserts into a vertical sleeve in the front and back windows and the windows neatly coils as they are unzipped. This eliminates the need to roll and tie off the window flap when it is open. A battery powered LED light hangs from the center of the ceiling and has a remote control switch to allow operation while lying down. A 4 D-cell battery holder is also provided to provide power for the LED light cord. Since the standard Evanston 8 already has a hinged door, the Elite does not appear to offer that much of an upgrade for family camping. The price, however, may be 50% higher. Campers on a budget would probably be best served with the standard Evanston in this size. The Elite Evanston 8 Tent weighs 25 lb. The Evanston Screened Tent features an integrated front screen room that leads to the tent body. The 3rd flexed pole over the doorway of the Evanston tent body creates a more vertical wall to better support the back of the screen room. A 4th flexed, "hoop" pole supports the front of the screen room. The screen room is 5' deep by 10 to 12' wide, offering space for several people to view the outdoors without being bothered by flying or crawling insects. The rainfly canopy covers the top of the screen room and protects the doorway. A roll-back, D-shaped door leads from the screen room to the main tent. The attached screen room allows the tent body door to remain open during the day for easy access in and out, without being bothered by insects, which is probably why the Evanston Screened Tents feature roll-back, instead of hinged doors. The Evanston Screened differs from the Evanston, in that it has windows on the side walls and open mesh on the upper back wall, instead of the other way around. The rainfly covers much of the back wall, all of the mesh panel there and also sheds rain away from the mesh to the ground. The tent does provide privacy, when all of the storm flaps are closed. A ridge rainfly pole runs from side to side over the main tent body, lifting the rainfly to form peaks over the closable windows. The side and front walls of the screen room are non-closable screen mesh and thus do not have storm flaps to shut against rain. These walls are also not covered by the rainfly canopy. In moderate to heavy rain, campers may need to retreat into the tent. The screen room walls slope outward towards the ground, so even some light, vertical rain will get through onto the screen-room floor. Rain that falls onto the rainfly over the screen-room should be shed to the ground, but rain that falls onto the screen panels will likely drip through. The tent body itself, once the seams have been sealed, should provide good protection against light to moderate rain. These rain issues are a small price to pay for having immediate access to a screen room from the front of the tent. The Evanston Screened Tents don't have the electrical port, most likely because an extension cord will first need to pass through the screen-room door and can then more easily pass through the tent-body door. The Evanston Screened Tent body is two feet less deep than it's corresponding-size, standard Evanston Tent model. This space is transferred from the tent body to the screen room and allows the room to be deep enough to be useful, and yet the entire tent can still fit on a 15' tent pad. Prospective Evanston shoppers should take care not to confuse the standard Evanston Tent with front canopy against the Evanston Screened Tent with front screen room. The Evanston with screen room will be specified as the Evanston "Screened" Tent. The Evanston Screened 6 Tent is 10' wide by 14' deep by 68" (5'8") high. The main tent body is 10' wide by 9' deep, and the attached front screen room is 10' wide by 5' deep. The screen room tapers in width towards the front. The front screen room should comfortably hold 3 camping chairs. The tent-body door opening may not be tall enough to pass a fully inflated queen mattress through. A queen mattress is 5' wide, and, with the tent being 5'8" tall at the peak, the door opening can easily be less than 5'. The 110 square feet of main tent floor space is rated to sleep up to 6. The Evanston Screened 6 Tent should comfortably sleep 3 to 4 adults or a family of 4 to 5 with children. Note that this tent is 4" shorter in height than the standard Evanston 6, and will not be tall enough for tall campers to stand upright. Due to the larger amount of tent and screen-room wall area to catch wind, the lower ceiling height may be designed to keep the tent more stable in moderate winds. Due to the front screen room with floor, this tent will require a tent pad with a 15' dimension, in order to set it up. The Coleman Evanston Screened 6 Tent weighs 20 lb. The Evanston Screened 8 Tent is 12' wide by 15' deep by 72" high. The main tent body is 12' wide by 10' deep, and the attached front screen room is 12' wide by 5' deep. The front screen room should comfortably hold several camping chairs. The screen room tapers in width towards its front entrance. The 120 square feet of tent-body floorspace is rated to sleep up to 8. The Evanston Screened 8 Tent comes with a roll-back door, not a hinged, swinging door. Evidently the screen room keeps the flies out well enough that the tent-body door can be rolled back, tied off and kept open during the day. This can be a handy feature, when flying insects are a nuisance. The tent should comfortably sleep 4 adults or a family of 6 with children. Tall campers will likely prefer the Evanston Screened Tent in this size, due to the extra height of the tent body and screen room. The Evanston Screened 8 Tent weighs 25 lb. and will fit on a 15' by 15' tentpad. Campers can cover the screen-room screening in moderate to heavy rains to keep the water out. A sheet of plastic with clips or clothes pins should suffice, as long as the wind is light. Clip the sheet to the front hoop pole under the rainfly. Water will likely form puddles on the screen-room floor during rain and need to be removed afterwards by working it towards the front center of the room, where there is a small mesh grate in the floor for water to run onto the ground. The tent can be set up so that the entrance is slightly downhill from the rest of the tent, to help pooled water flow away from the tent body door on its own. The canopy of the screen room does slope downward towards the front, allowing rain to flow away from the tent body, but reducing headroom a bit. Screen rooms are mainly sitting rooms, so this should not be an issue for enjoying the space. The front hoop pole of the screen room will likely direct rainwater on the canopy to the sides and onto the ground. In warm, still weather, orienting the screen room into the wind will be the best strategy. In windy and rainy weather, orient the screen room away from the wind. The screened Evanston tents are approximately 4" shorter than the corresponding-size Evanston tent without the front screen room. This is probably due to designing the extended tent to be more stable in wind, since the screen room adds fabric, which increases the wind force on the tent poles. Since 2012, Coleman has upgraded the Evanston Screened Tent from a 2 pole to a 3 pole dome tent. Adding the screen room increased the wind force on the front of the tent, and the 3rd pole over the tent-body doorway should definitely improve the Evanston Screened performance in moderate winds. Due to the front screen room, the Evanston Screened Tents are too large to fit on a 12' x 12' tent pad, but will fit easily on a 15' x 15' tent pad. Non-closable mesh upper-wall panels mean that the Evanston will stay more comfortable on warm evenings. It also indicates that the tent may not retain heat well on cool evenings, and campers may need to take extra measures to stay warm. The Evanston Screened Tent does not feature a ground vent. The door has a window in the upper panel, instead of a separate screen. A ground vent can easily be fashioned by zipping the screen room closed and zipping open the bottom of the tent door. The standard Evanston Tent features a "privacy vent window", which evidently refers to the rainfly-covered mesh wall panel(s). These should increase ventilation, when the windows and doors are closed. The greater rainfly coverage and front canopy allow this tent to perform better than most economical dome tents in rain. The third pole over the doorway intersects the other two tent-body poles and provides extra support in the wind. However, in moderate to strong winds, it is a good practice for more stability to orient the tent, so that the back side is into the wind. Otherwise, the front canopy can easily catch wind and damage the tent. The 1000-denier polyethylene (tarp-style) bathtub floor will resist standing water on the ground around the tent. The Evanston models are best suited to light to moderate winds, which should generally be the norm in sheltered (forested) campsites. In exposed campsites, campers should observe how the tent performs in moderate winds and be prepared to park a vehicle upwind of the tent if the wind freshens, i.e., strengthens. The Evanston offers more rainfly coverage of open mesh panels than the Coleman Sundome. On a hot, still night, the Sundome, with its large ground vent, may be a bit more comfortable, but in more than gentle rain, the Evanston should outperform. The wings on the standard Evanston canopy extend to near the ground, which shelters the doorway from side winds and wind-driven rain. Campers may well find more protection from side rains under the winged canopy of the standard Evanston than in the screen room of the Evanston Screened tent. If insects are not much of a problem at your campground, this model may be more suitable than the Evanston Screened. The floor-dimensions of the standard Evanston are square. The tent-body floor dimensions of the Evanston Screened are rectangular. According to the Coleman e-catalog, all of the Evanston tents, standard, screened and elite use 68-denier tent body, rainfly and mesh fabric. A Cool Air Port in the lower back wall appears to have been removed from the design of the standard Evanston a year or two ago. (The Evanston Screened never had one.) According to reviewers, the tent currently has no ground vent. The Evanston 4 no longer appears in the current catalog, but is still offered for sale. The main poles on the Evanston 6 & 8 sizes are 11mm (7/16") fiberglass. Campers should take care to keep the tent out of strong winds. Sleeves and clips attach the tent body to the pole structure. Ring and pin connectors attach the poles to the tent base. The Evanston pitches like a standard dome tent with 2 extra poles to thread through sleeves, flex and attach to the tent floor. The Coleman Evanston Tent is an interesting choice for campers looking for an economical dome tent that offers more shelter from rain. Some models are available with attached screen rooms and are suited to camping when insects are a nuisance.